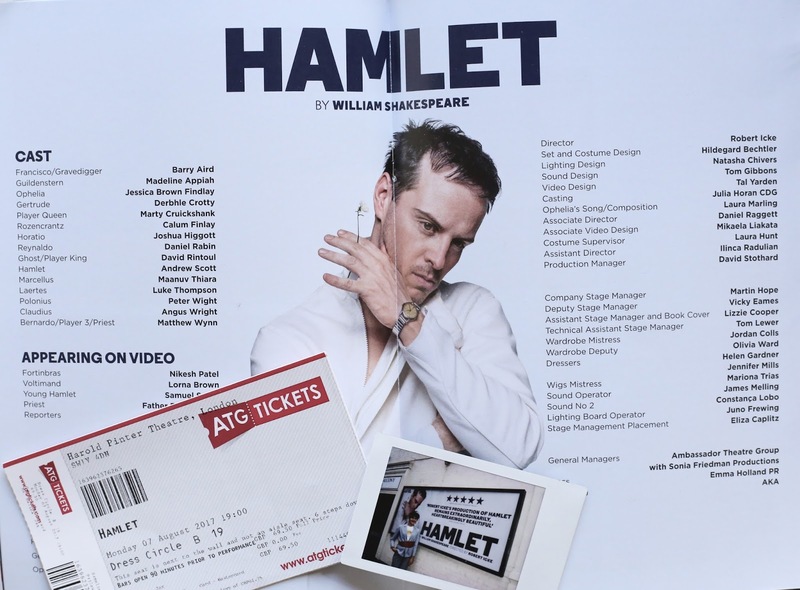 this is something completely new on my wee fashion and travel blog, especially because I am writing in English, but I saw Hamlet in the Harold Pinter Theatre a few days ago and I wanted to give you a short review about this production directed by Robert Icke. Please keep in mind that I am German and as a consequence, my German is better than my English. So, let's give it a go! You all might know that I am a huge fan of musicals and I love spending a night out in the theatre. It brings me a lot of joy to see actors living their dream on stage. They all seem to be so passionate about their job, which is catching. For all musical addicts London or the West End is the place to be. I previously informed myself about all these productions and which musical or show I wanted to watch. On my bucket list, there was definitely Wicked, but then I bumped into Hamlet. We read Macbeth in school, but somehow I was not into Shakespeare. It is a shame to say that, but it's the truth. Somehow my teacher wasn't capable of infecting me with this important playwright. So, why did I then buy a ticket for Hamlet and not for Wicked? Why would you spend more than 70 pounds on a play you are not quite sure whether you will enjoy it or not? Well, I am a huge fan of BBC's Sherlock and when I found out that Andrew Scott, who previously played Moriarty, is the new Hamlet, there was no doubt! I had to preorder a ticket! My mum was not so happy about it: "Melle, 70 pounds for a show you're not into? You only want to see a show because of one actor? What if this actor is ill on that day? Why don't you buy the day seats for £10? That's ridiculous!" On Sunday, my mum and I went to the Harold Pinter Theatre to get my ticket. But unfortunately, the theatre was closed. Well, the actors deserve their day off because they have a hard job remembering all these lines. 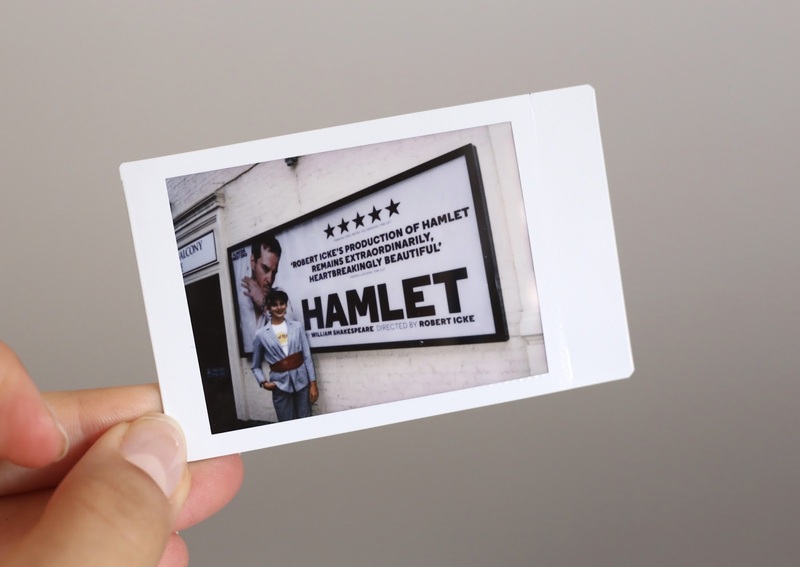 Did you know that Hamlet is Shakespeare's longest play with more than 4,000 lines and almost 30,000 words? That's impressive! I have to admit that I have never read Hamlet before and didn't know the plot in detail. I only knew that it was about Denmark and that a famous ghost appears and I was able to quote "To be or not to be, that is the question". Before the performance my sister and I went to Harrods, just a tourist thing, and I bought Hamlet, the book. Honestly, this was the only thing we could afford there. I have just read the first two pages before the performance in the evening, but you could say that I went to it without any knowledge at all. On Monday, I finally got my ticket and in addition to that, I also bought a program for 4 pounds, which includes a lot of pictures from the production, the cast, information about the Ambassador Theatre Group LTD and about Hamlet itself and well-written text about "the voices in our heads" by Jerome Groopman. To conclude, it's a nice little souvenir, which makes me think about a wonderful production. My seat was in the Dress Circle and I was surprised how relatively "small" the theatre was. Okay, with its capacity of 837 seats the Harold Pinter Theatre is not that small, but I am used to bigger theaters. I have to admit that I was really happy with my view on the stage. At 7pm it started with the opening scene and a television screen showing a ceremony of the King's death. It was a part of the Danish news because the play is set in Denmark. I was surprised because of the technique and I imagined it to be more old-fashioned. So my first impression was "Oh, these are the original words put into a modern setting"and this was by no means in a negative way. Then you could see a man in front of a desk checking the security camera, when suddenly a ghost appeared on camera 7. But there were more people: Bernardo (an officer played by Matthew Wynn), Francisco (a soldier played by Barry Aird), Horatio (Hamlet's friend portrayed by Joshua Higgot) and Marcellus (the second officer who is shown by Maanuv Thiara). Although I had slight problems with the names in the beginning (that's because I did not inform myself), I got into it really quickly. I liked the gloomy and sinister atmosphere in this theatre, which was so glorious when the lights were still on. I felt the tension pumping through my body and that has never happened before! But then there was a quick transition to another scene and the audience saw a terrace with a glazed front. The stage was divided horizontally: in the background there was the inside of a building, where people enjoyed a ball, laughed, danced and partied, and in front of the glass, there was a big sofa on the terrace. The audience was introduced to most important characters of the play: Hamlet, the new king of Denmark whose name is Claudius, Polonius, Laertes, Voltimand, Cornelius and I think that Ophelia also sat on the couch. Hamlet's mother, who is now married to her husband's brother, wants Hamlet to stay in Denmark and go not to Wittenberg ("Let not thy mother lose her prayers, Hamlet: I pray thee, stay with us; go not to Wittenberg!"). I want to point out that Derbhle Crotty played Gertrude in such a sensitive and wonderful way. She fits perfectly in this role. Her husband Claudius, who was outstandingly played by Angus Wright, was the previous king's brother. My first gut feeling, when Claudius went on stage, was "I don't trust him!". I do not why, but I wasn't able to wed this character before I have even known that Claudius was accused to have murdered the previous king. During the play, Hamlet meets with his father's ghost, who alleges that his own brother (Claudius) murdered him. And then the Hamlet's madness or lunacy starts! It was heartbreaking to see Hamlet this vulnerable and somehow left-alone on stage. As a visitor, I just felt so moved by his words and I felt the need to hug him and get him out of this prison ( "Denmark's a prison"... "Denmark being one o'th'worst"). 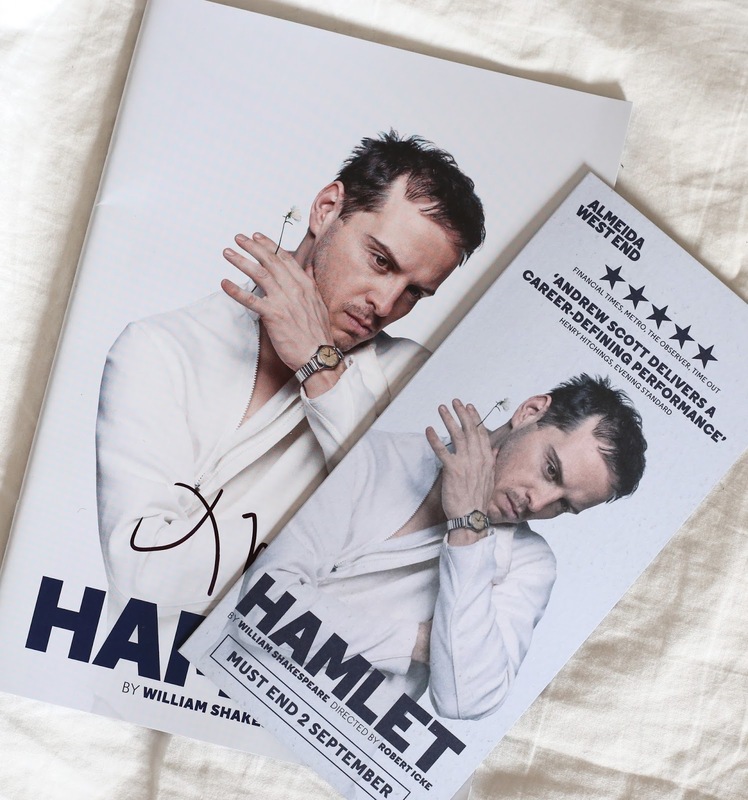 Andrew Scott played in such a real way that I was not sure whether a human body is able to express so many feelings. He switched from happiness to madness within half a second. He started to scream, trample, cry and then laugh, like it's the easiest thing in the world. I especially liked his play with his hands and when he threw them up in despair. I was blown away! Hamlet's "love" with Ophelia, played by Jessica Brown Findlay, was also part of the tragedy. Jessica Brown Findlay also fit perfectly and especially in the ending after Polonius, her father, had died, she blew me away. Ophelia went nuts and run in circles, she screams, cries and she distributes different flowers to different characters ("There's rosemary, that's for remembrance." / "And there is pansies, that's for thoughts!"). When I have first seen Ophelia she seemed so shy and I was surprised how round this character was. That development can be traced back to the fact that Hamlet shot Ophelia's father Polonius. Polonius instructed his daughter not to see Hamlet anymore (Ophelia: "No, my good lord; but, as you did command, I did repel his letter, and denied his access to me."). Peter Wight made the audience laugh several times, which was very refreshing. Another actor who stood out was Luke Thompson, who played Polonius' son Laertes. Particularly the grave scene with Ophelia's corpse and Hamlet was so "disgusting" and well-played! Laertes jumps into Ophelia's grave and he begs the attendants to bury him with her. His mimic and gesture during the whole play was on point. I have to say that every actor/actress was perfect and made me fall in love with this play so much! You were all lovely! 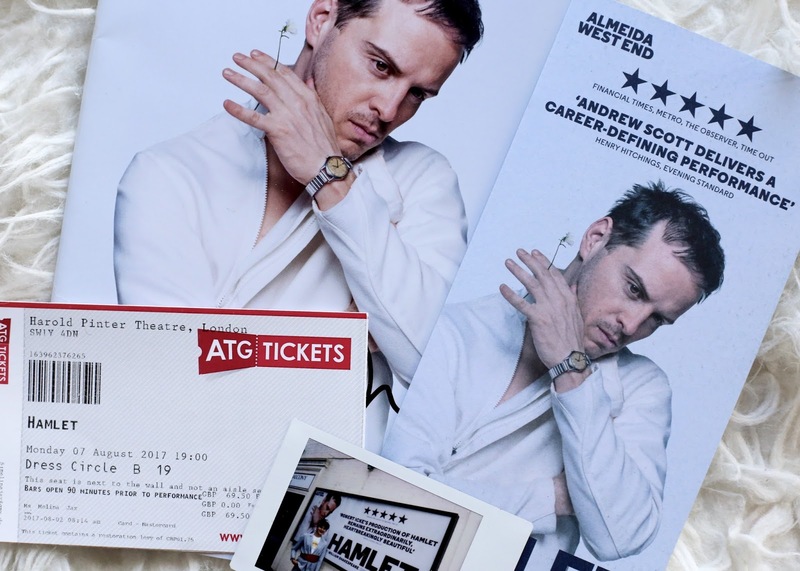 After the performance the audience could stay in the theatre to attend a Q&A with the cast, but I went straight to the stage door to get a place at the barrier because I wanted to meet Andrew Scott. There were a few fans and I joined them. Firstly, I asked them whether this is the "real stage door" and then we build up a small conversation and I found out that they were Sherlock fans from Germany. Greetings, guys, you were lovely and it was a pleasure to meet you! We waited eagerly! And after half an hour Andrew came out! He was so lovely and he took a picture with every fan (and there were like 50 supporters) and in addition to that he signed every program for his fans. We were all so happy (only fan girls will know...)! Thanks so much Andrew for your time and your patience! To conclude, this was without a doubt the best performance I have ever seen and I have never seen anything so breathtaking and wonderful! During these four hours I didn't take a look at my watch and I am a very lively and jolly person, who enjoys talking or moving. But Robert Icke made me keep quit and he let me dive into this tragedy. Moreover, I was never sure whether a human body could express so many emotions. All actors did an amazing job, thanks so much! The only thing I regret: Why didn't I order two tickets for two days? I highly recommend watching Hamlet at the Harold Pinter Theatre! If this production doesn't make you fall in love with Shakespeare, then nothing will.